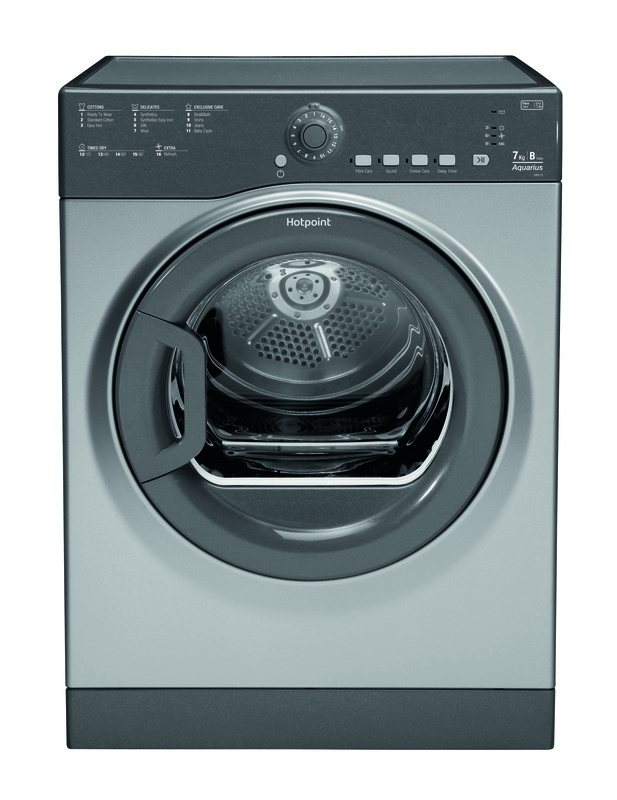 This Hotpoint TVFS 73B GP.9 (UK) Freestanding Vented Tumble Dryer comes in a Graphite finish to complement any setting and features a 7kg drum capacity. This appliance is designed to protect your garments and features some of our newest care technology. Features include the Fibre Care option, which has been specially designed for delicate clothes and automatically adjusts settings so that the lowest temperature is being used for a longer duration to ensure a thorough but gentle dry; Anti-Tangle technology, which uses a reverse tumble action to ensure that your clothes dry evenly and without tangling together to keep them looking better for longer; and our Anti-Ageing technology, which utilises an innovative wave drum design to lift clothes softly on a cushion of air to help maintain their natural softness and colour. This appliance also includes the Sensor Drying option, which enables you to 'set and forget' your drying with the knowledge that it will dry perfectly to the level you have specified.